Get involved in the game! Watch this exclusive TAG Heuer panel debate between David Seaman and Tim Sherwood ahead of the North London derby (live from Friday, 3pm) and then take the TAG Heuer Premier League Pressure Test to have the chance to win tickets to see your team live! David Seaman and Tim Sherwood know a thing or two about North London Derbies and the two former players have been having their say ahead of tomorrow’s huge clash between Arsenal and Tottenham. Spurs head in to the game as the bookies favourites as they sit four points above the Gunners in the table having finished above their rivals for the first time in 20 years last season. 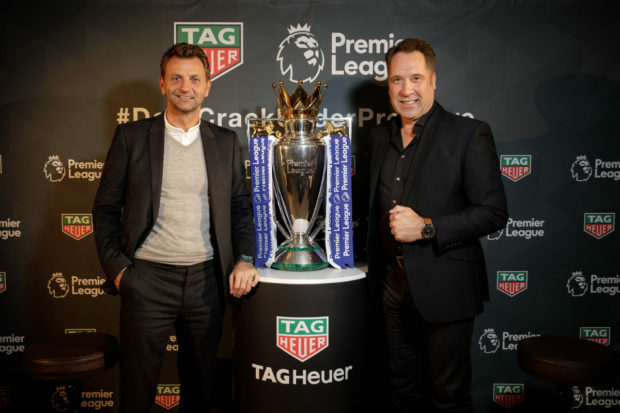 No doubt this game will go a long way to determining who gets the bragging rights this campaign so Premier League sponsored TAG Heuer have teamed-up with two former Arsenal and Tottenham players to get their expert insight. Seaman spent 13 years keeping goal at Arsenal between 1990 and 2003 and helped the Gunners to a whole host of honours including three league titles and 4 FA Cups. Sherwood on the other hand spent four years as a player at White Hart Lane and held several roles at the club before becoming manager in 2013 when he led Tottenham to a sixth-placed finish. The two men faced off on the pitch several times during their careers but now they’ve locked horns off it as they discuss tomorrow’s NLD as part of the TAG Heuer’s ‘Pressure Test’ derby debate. As the official timekeeper and watch partner of the Premier League, TAG Heuer will be at the heart of the action this weekend. Football Talk readers have the chance to win tickets to see their team in action by taking the Premier League Pressure Test. Race against the clock to answer ten Premier League questions in the fastest possible time. Seaman and Sherwood discuss the pressure surrounding big matches, share their favourite Arsenal v Tottenham moments and offer insights ahead of this weekend’s game. They also provide their predictions for the match and unsurprisingly Seaman goes for a 2-1 Arsenal win while Sherwood backs Spurs to come away with all three points. “As a player, if you can perform in a North London derby it gives you a bit of a break… as a Tottenham player, in those days Tottenham weren’t chasing title, so it was about beating Arsenal – if we could beat them fans would have the bragging rights no matter what they won. “Neither team will change their approach. Arsene Wenger doesn’t change his game for anyone, and they’ll both be on the front foot. We’ll see an open game and it may suit the likes of Sanchez in the middle, as there could be space. If they can get the ball to Sanchez Spurs may have a problem – he’s a world class footballer.